It is an automatic system that is optimized and ready to use. The EA uses averaging of loss-making positions and the martingale system if the price goes against the direction. The EA opens orders in a particular direction, so that in case of unfavorable development of the situation on the market, it can close a series of deals at the minimum price retracement. The strategy is pretty good. This is a scalper, hence makes a large number of transactions. This is a fully automatic system, but it can be used in semi-automatic mode, to reduce the risks, for example you can disable the EA during important news releases. The EA is recommended for use on EURUSD, M1 timeframe. It can also be used on other currency pairs. 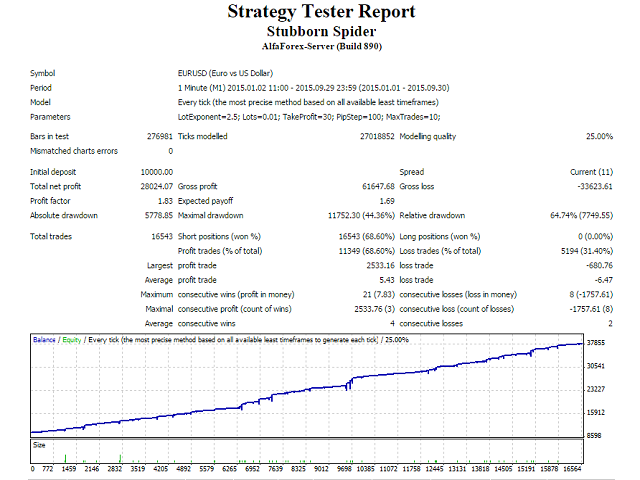 Before using on a live account, it is recommended to test the EA in the strategy tester. The EA can work with almost any broker. However, the minimum Deposit is 1,000 and the recommended deposit is 10,000 dollars or cents on 0.01 lot. Leverage from 1:200, recommended 1:500. LotExponent - the multiplier of the subsequent lots. Lots - the size of the initial lot. PipStep - the minimum spacing between orders. MaxTrades - the maximum allowable number of transactions. MagicNumber - set the magic number. EA NAME IN COMMENT - your comment. Does what it should do. Much profit in a short time. This is a simple and efficient martingale bot which has done very well! you can check out his own signal which has done well. Of course it is not risk free, nothing in forex is, but if you have a proper risk diversification strategy, then it will complement your portfolio very well! Added the ability to change the magic number, added the ability to change the comment.